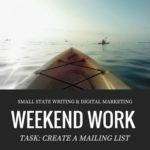 Weekend Work is the weekly series of #marketing strategy for business owners and creative entrepreneurs. Weekend Work is chunked tasks you can complete outside regular working hours. Goal: Start an #email marketing campaign. Use MailChimp’s free service to collect emails of customers and interested potential customers. Then use the list to reach them directly. This is the perfect weekend to get started on an email marketing campaign if you don’t already have one. 1. Don’t be intimidated by the words “email marketing campaign.” Services like MailChimp and Constant Contact have been around for years and have made email marketing simple and virtually free for small business owners. 2. Start now. If people have signed up for your email list, that means they are already interested in your products or services. Why would you fritter that resource away? 3. Create an account on MailChimp. Why Mailchimp and not Constant Contact? In a word, integration. MailChimp continually ensures its mail product will just plain work with all the leading email, social media and web platforms. It’s hassle free and, in addition, it continually refreshes its templates and designs to keep pace with design standards and trends. The one thing you must know about email lists before you do anything. You may be tempted to just import all of your business contacts to MailChimp and start emailing away. MailChimp tutorials abound. I like NYCTechClub’s “How To Use MailChimp Tutorial – STEP BY STEP – 2016”, so I’ve posted it here. Note: This tutorial doesn’t address collecting emails. Collecting emails (via Facebook, your website and beyond) is a separate task. If you have questions on collecting emails, creating email campaigns or MailChimp in general, drop me a line. I am more than happy to help. #Weekend Work Task 1: Website Review. Goal: Determine if you have a website, and how that website is working for your business, right now. You need to get a website. Customers use a website to answer questions about you and your products or services when you are not there. It’s a must-have. Not having a website is akin to not wearing pants. But hey. There’s probably a reason you don’t have one. The most common one is: I’m so confused and overwhelmed. Yes. yes. I hear you. Decide the URL you want your website to have. Keep it simple to speak and spell. Try to claim a .com or .net (.org for NFPs) if you can. Pick One. Register the domain(s) now. Use GoDaddy.com to search and find the best domain name. Pay for it now. Set it up to renew automatically. Register. Determine your budget on website build. Consider your own willingness to learn graphic design, SEO tools, website hosting and more. Budget. If you are determined to skip an investment in a professional design and build DIY (for now), start researching “free” website design tools such as Wordpress, Wix and Weebly. None of these are truly free but they will get you started. Choose one. If you have a budget, put out feelers for a website designer and content creator. Start with your local Facebook groups or other area business owners whose websites you love. Ask them who they used and (more importantly) if they were happy with the service. Contact them. Make notes. Keep a notebook or Evernote log of what you think your customer wants when they come to your website. Add to it whenever you can. Organize. Q. So you DO have a website? Conduct your website review. Open an email draft and be ready to type notes to send to your website administrator. Do you “Ask them to act”? That is, do you have a call-to-action button and/or text on your website where you ask your visitors to hire you or buy your service? Add it. See any broken links or missing photos? Click them and fix them. Read the website for errors and outdated info. Send corrections. Social media links. If you have social media, these sites need to appear on your website. Link them. Is your contact form working? Test it. Wait… Do you even have a contact form? If not, add one. Hey, I think that’s enough for this initial Website Review. There’s more to think about when it comes to marketing strategy and your website as the face of your business. Is it written for your target client or customer? That’s a topic for another week. If you have questions or would like further information or support, feel free to reach out to me. I’m here to help.